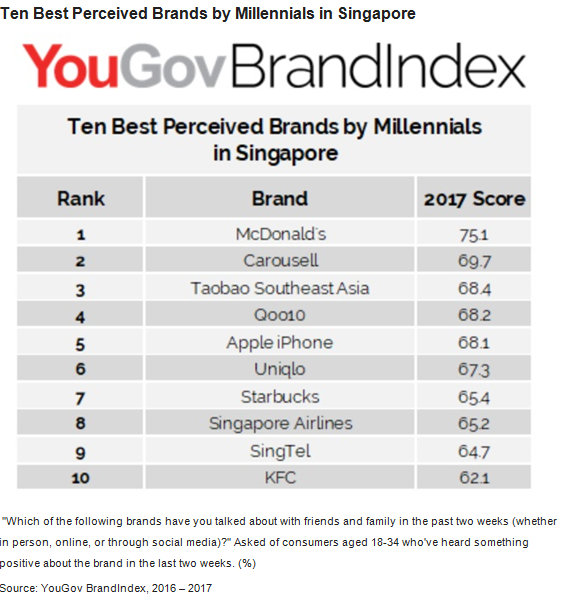 McDonald’s, Carousell and Taobao Southeast Asia are the top three best perceived brands by Millennials in Singapore, according to a recent ranking by YouGov BrandIndex. All three brands achieved the highest word of mouth scores in Singapore – 75.1, 69.7 and 68.4 respectively out of 100. Meanwhile, Qoo10 (68.2) and Apple iPhone (68.1) ranked fourth and and fifth respectively. Among the top 10 also included Uniqlo (67.3), Starbucks (65.4), Singapore Airlines (65.2), Singtel (64.7) and KFC (62.1). E-commerce and m-commerce brands dominated the Ten Best Perceived Brands by Millennials in Singapore list, with three out of five coming from the industry. Meanwhile, the list also showed that fast food chains and casual dining brands are popular among Millennials. 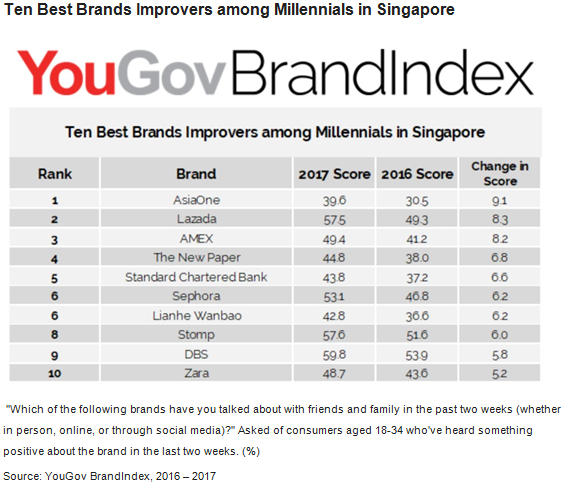 AsiaOne topped the list of Best Brands Improvers among Millennials in Singapore, seeing a jump from 30.5 in 2016 to 39.6 this year. Lazada came in second with a score of 57.5 this year, as compared to 49.3 in 2016. AMEX was ranked third with a score of 49.4 in 2017, as compared to 41.2 last year. “Millennials, those were born between 1980 and 1999, are one of the largest and most technology savvy generations ever. Marketing to this demographic is a priority for established and emerging brands alike. Leveraging BrandIndex and its different measurement metrics, we can see which brands are the most popular in the eyes of this generation,” Ervin Ha, head of data products at YouGov Asia Pacific, said. “Millennials seek novelty and are adventurous to try new things. Millennials, being the trendsetters, is a segment that KFC focuses on to chart our forward strategies in the aspects of product innovation, store designs, building brand and creating value,” Juliana Lim, senior marketing director, Kentucky Fried Chicken (KFC), said. When it comes to food, Millennials will jump on the latest trends and even challenge themselves, Lim said. As such, KFC is constantly working on its product offer to excite them with interesting and trendy innovations such as the KFC chizza, hot devil drumlets and the Hawaiian double down. In order to engage with the Millennials, KFC has moved towards more content marketing and social digital advertising. It has also partnered with various key opinion leaders and conduct “out of the box” activations to drive conversations around the brand. A spokesperson from Carousell said that the company’s popularity amongst Millennials is a testament to how sustainability is a priority for them. More Millennials are recognising this and are playing their part to recirculate and reduce excess. Hence, Carousell thrives in communities where users want to make room in their lives and move toward having more meaningful experiences instead. “Millennials will always be a core market for our business, and we are looking to expand our offerings to serve a wider demographic,” the spokesperson said. To cater to a wider audience, the spokesperson added that Carousell has improved its category offerings to include a myriad of products such as textbooks, furniture, home decor, cars, jobs and services. Carousell intends to continue exploring ways to make buying and selling even simpler and more efficient, especially for higher value categories such as cars, jobs and properties. The spokesperson noted that Millennials are looking for better purchasing and selling experiences compared to what is currently offered in the industry. To better serve Millennials, Carousell is also improving its community experience by launching Carousell Groups, where users can meet others with similar interests and easily find products they want. YouGov BrandIndex asked 1,500 brands if they have heard of anything positive about the brand in the last two weeks, through advertising, news or word of mouth. 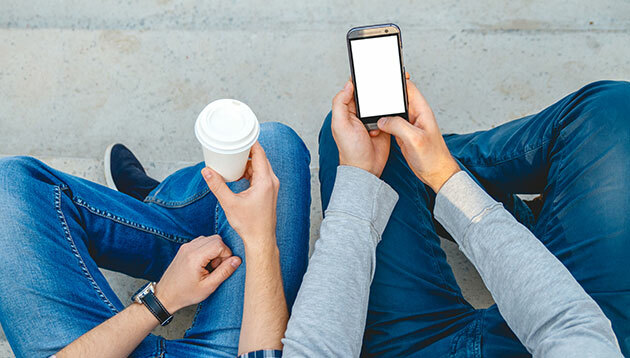 Brands with low response volume were eliminated and the rest were ranked on word of mouth scores, which was based on whether the brand has been talked about in the past two weeks among family and friends. YouGov BrandIndex interviews thousands of consumers every day, yielding over 2.5 million interviews each year. Respondents are drawn from our online panels of 5 million consumers across 31 countries. Marketing magazine announces the launch of a major new Asia-based annual event for marketing, media, agency, digital, social and ..
Spotify is tracking rapid growth in several Asian markets. Here is its plan for the region. ..